Muscle, joint & arthritis pain relief. 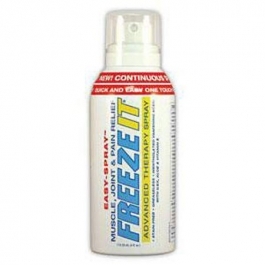 Stain-free; Greaseless; Mentholated vanishing scent with ilex, aloe & Vitamin E. Freeze It Advanced Therapy Pain Spray can be used for temporarily relief of minor pain associated with: Arthritis pain; Simple back pain; Muscle sprains; Cramps; Bruises; Bursitis; Tendinitis; Joint pain. Temporarily relieves minor pain associated with: minor arthritis pain; simple back pain; muscle sprains; cramps; bruises; bursitis; tendinitis; joint pain. Shake well before use. Adults and Children 12 Years and Older: Apply to painful muscles and joints. Gently massage thoroughly into affected area. Repeat as necessary, but no more than 4 times daily. Do not use with heating device. Store at room temperature with cap closed tight. Store in a cool dry location. For external use only. Use only as directed. If condition worsens, contact your doctor. Avoid contact with eyes. Pregnancy-Breast Feeding Warning: If pregnant or breast feeding, ask a health professional before use. Do not use with other topical products. Do not use with any heating device. Keep away from excessive heat or open flame. Keep this and all medicine out of reach of children. In case of accidental ingestion, seek professional help and contact a Poison Control Center immediately. Do not apply to open wounds or damaged skin.